Will Carlton skipper Evan Gulbis repeat his individual performance from the Preliminary Final against Essendon of 130 & 6/45? The time is now upon us where we arrive in the first weekend of April and the competition has been whittled down from 18 competitors to just two to fight for the title of Victorian Premier Cricket Premiers for season 2018/19 and bragging rights over the winter. The completion of Week 3 of the Finals saw both matches impacted in some part by wet weather, but enough play was available to enable results in both matches. Carlton defeated Essendon by 57 runs in Preliminary Final #1 at Princes Park #1. 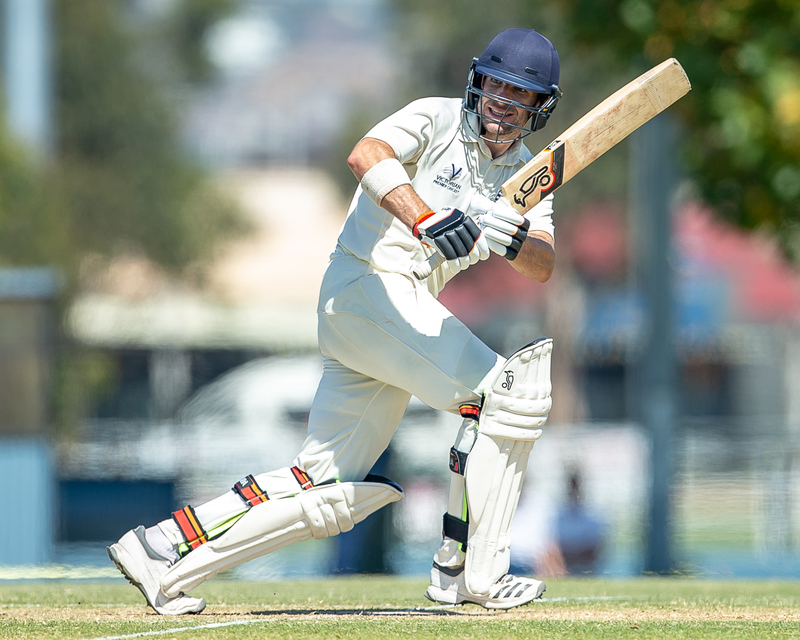 The undoubted star of the show was Blues skipper Evan Gulbis, who showed his all-round class with 130 from the willow (out of 257) and 6/45 with the ball to restrict the Bombers to 200 in reply, while key support for the Blues came from Brayden Stepien (36) and Xavier Crone (2/32). For the Bombers, Matt Doric (5/81), Clint McKay (36 & 3/75), Isaac Willett (30) and Michael Hill (51) were the leaders after the early loss of James Seymour (2), Aaron Ayre (14) and Justin Galeotti (15) left the Bombers at 3/31 in their run chase – a task that eventually proved too much to overcome. In the other Preliminary Final, Geelong ended the gallant run of Fitzroy Doncaster by amassing 8/421 before dismissing the Lions for 240. The Cats’ charge was started by the club record-breaking stand of 287 between Mitchell Reid (166) and skipper Eamonn Vines (116), before cameos from Hayden Butterworth (35) and Thomas Jackson (31) kept the board ticking over. For the Lions, Trent Lawford (2/73), Chris Moore (2/52) and Jack Rudd (2/75) were the better bowlers. In reply, the Lions started strong with Matthew Bremner (46) and Jack Rudd (34) opening with a 76-run stand. Despite efforts from Nat Vardi (69) and Liam Banthorpe (34), the tail fell sharply, and the chase ended at 240 with Brody Couch (5/44) and Brenton McDonald (3/70) doing the damage for the Cats. And now the last weekend of the Victorian Premier Cricket season has arrived. For both clubs it will be a chance to write their name in history. For Carlton, it will be a chance to add a fresh 1st XI Premiership photo on the wall of the Princes Park clubrooms and become their latest 1st XI title since the premiership of season 1980/81, where club immortals in Keith Stackpole, Dean Jones, the late John Scholes, Ian Callen and current President John ‘JD’ Douglas were gracing the hallowed turf of Princes Park. For the Cats, this is only their 2nd time to the ‘big dance’ since they joined the competition in the 1993/94 season and will be keen to go ‘one better’ than their previous attempt back in the 2007/08 season, where they fell at the final hurdle against Ringwood. Current coach Liam Buchanan was a part of this 2007/08 side, along with then-skipper Damian Shanahan, Aaron Finch, Clinton Peak, Andre Borovec, Trent Walerys and Marc Carson. Previous history between these two clubs has seen them only meet on two previous occasions in a Finals match, with the Cats winning both encounters in the past. These two sides met this season in Round 7, where the weather forced the scheduled two-day game to be played as a One Day game instead on the 1st December. 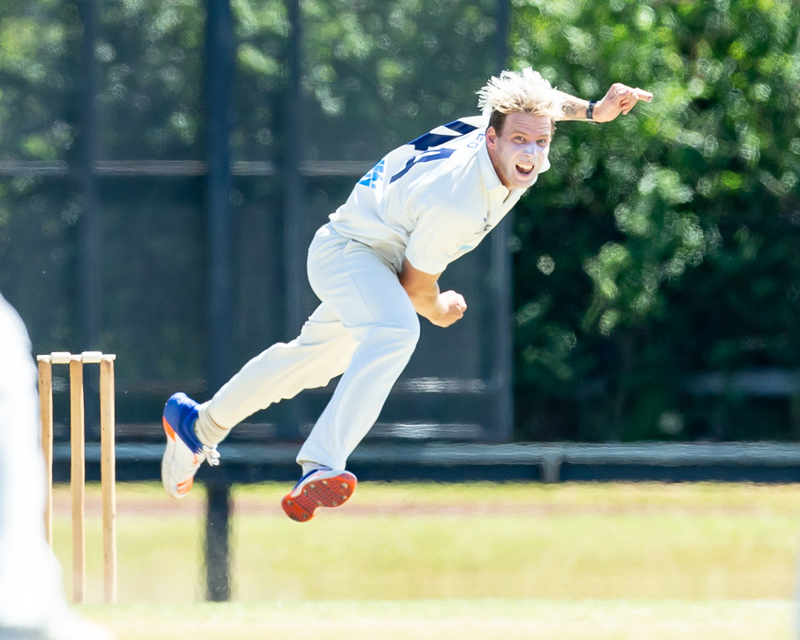 On that Saturday at Princes Park #1, Carlton accounted for Geelong by 8 wickets chasing 210 and secured a bonus point on the day after keeper Brayden Stepien (128*) kept the scoreboard busy, while Aaron Smillie (3/54) was the best Blues bowler on the day. For the Cats, Josh McDonald (52) led the starts with the bat but the bowling was impacted by the absence of Jake Reed for this game and saw the key bowlers go without a wicket. The Blues have managed to keep a very stable core of players in the 1st XI over the season. The batting card has been led by keeper Brayden Stepien (733 runs @ 56.38), with Nicholas Ross (549 runs @ 45.75), Harrison Smyth (510 runs @ 39.23), Thomas Smyth (392 runs @ 32.67) and Evan Gulbis (372 runs @ 41.33) all playing key innings across the season. 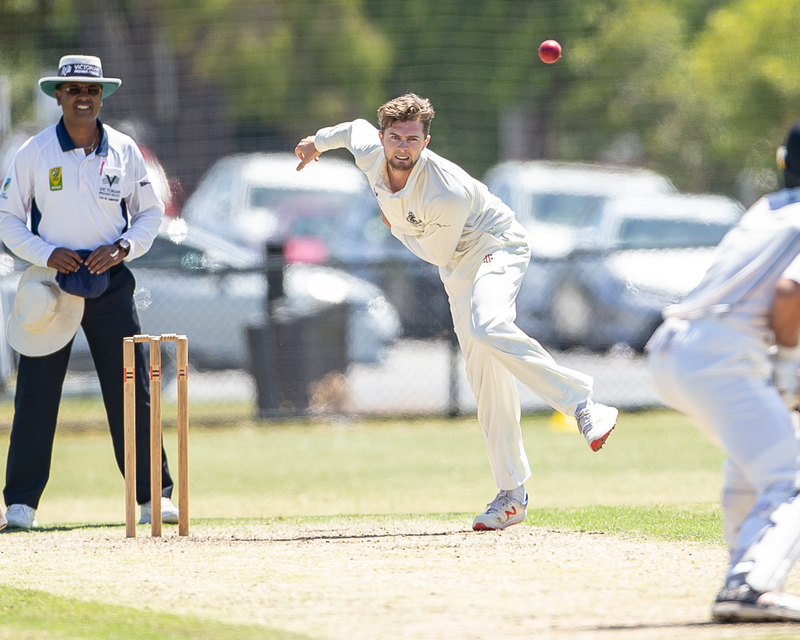 With the ball, Eddy O’Sullivan (36 wickets @ 19.78) leads the Carlton attack this season, with Aaron Smillie (34 wickets @ 16.71), Cameron Stevenson (29 wickets @ 23.41), Xavier Crone (19 wickets @ 25.95), Evan Gulbis (16 wicekts @ 26.19) and Thomas Smyth (14 wickets @ 24.29) all sharing the workload and providing a mix of experience and youth in the attack. The one area that may be on concern is the lack of players that have bowled across the season in the Blues 1st XI (only 8) and if one of them is injured it will put added pressure on the remaining bowlers. The Cats have been quite strong in the batting with the Geelong Cricket Ground in true batting form this season. Hayden Butterworth (647 runs @ 43.13), Eamonn Vines (642 runs @ 45.86) and Tim Ludeman (621 runs @ 44.36) have all been in strong form with the willow, while the support acts of Mitchell Reid (442 runs @ 49.11), Josh McDonald (436 runs @ 27.25), Angus Boyd (363 runs @ 27.92) and Thomas Jackson (327 runs @ 54.50) are all capable of producing the unexpected to keep opposition bowling attacks on notice. Both sides will be keen to take home the silverware at the end of the weekend and will give no quarter in the process. With the Blues having also defeated the Cats twice in the Vic SUPER SLAM this season, the Blues will have to go in as favourites, but the Cats will go out on the field with nothing to lose and will have the Blues firmly in their sights. The Victorian Premier Cricket Grand Final will be live streamed on the Victorian Premier Cricket Facebook page across the 3 days of play. Mitchell Reid (Geelong) scored his 1,000th Premier 1st XI run during his innings of 166 against Fitzroy Doncaster. Angus Boyd (Geelong) scored his 1,000th Premier 1st XI run during his innings of 18 against Fitzroy Doncaster.